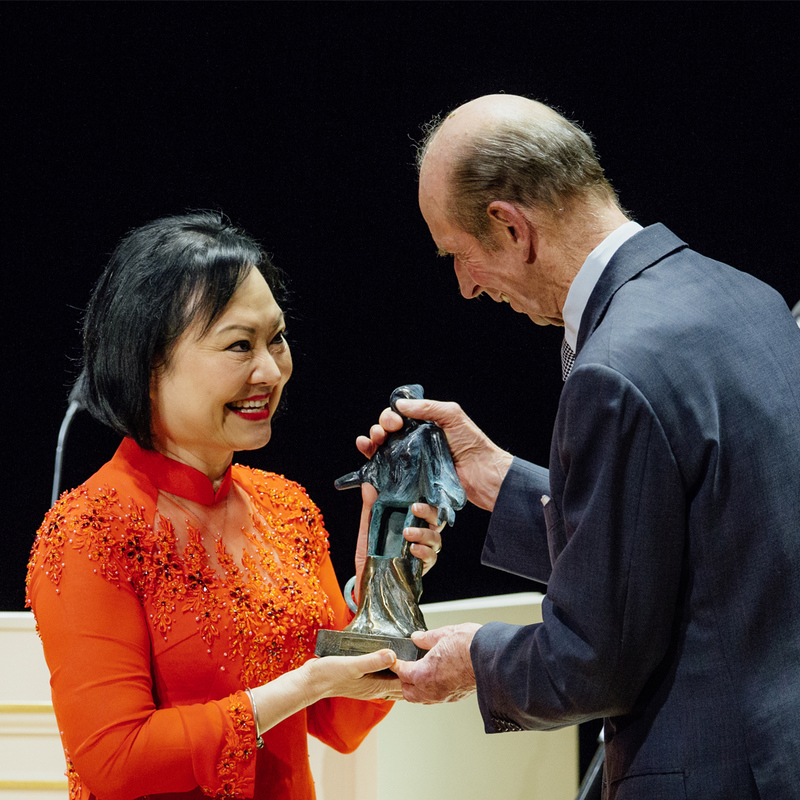 The awarding of the “Dresden Prize” to Kim Phuc Phan Thi was reported by the media worldwide. It ranges from American Time magazines, New York Times and CBS to sky.news, the British “Guardian” and “Independent” to media in Vietnam and Italy. In Germany, the ARD Tageschau as well as ZDF today and 3Sat broadcasted articles about the award ceremony. In addition, there are articles in FAZ, Spiegel-Online and Tagesspiegel, among others. 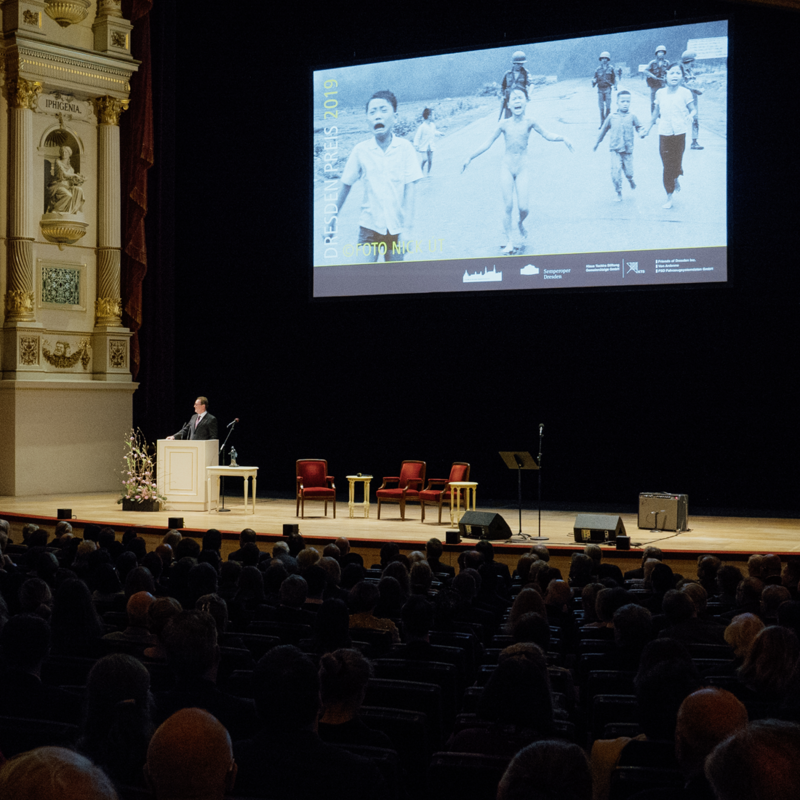 James Nachtwey, probably the most famous war photographer of our time, paid tribute to prizewinner Kim Phuc with an impressive laudation. He himself received the Dresden Prize in 2012, and Nick Ut’s photograph of the “Napalm Girl” in 1972 was an important reason why he became a photographer. Because it showed him that photos can make a difference. H.K.H. Duke of Kent was awarded the Dresden Prize in 2015 for his contribution to British-German reconciliation. Now he has presented the award sculpture to the winner of the 2019 prize. In his speech he mentioned the close relations between Dresden and Coventry. And he spoke about the reconstruction of the Frauenkirche, for which the British Dresden Trust – whose patron he is – donated the tower cross. „We are all living in unsure times. Reconciliation and friendship are needed now more than ever. The Dresden Prize would never have been possible without Nobel Prize winner Günter Blobel. He was the authoritative initiator. With his own passion he did everything for this prize. 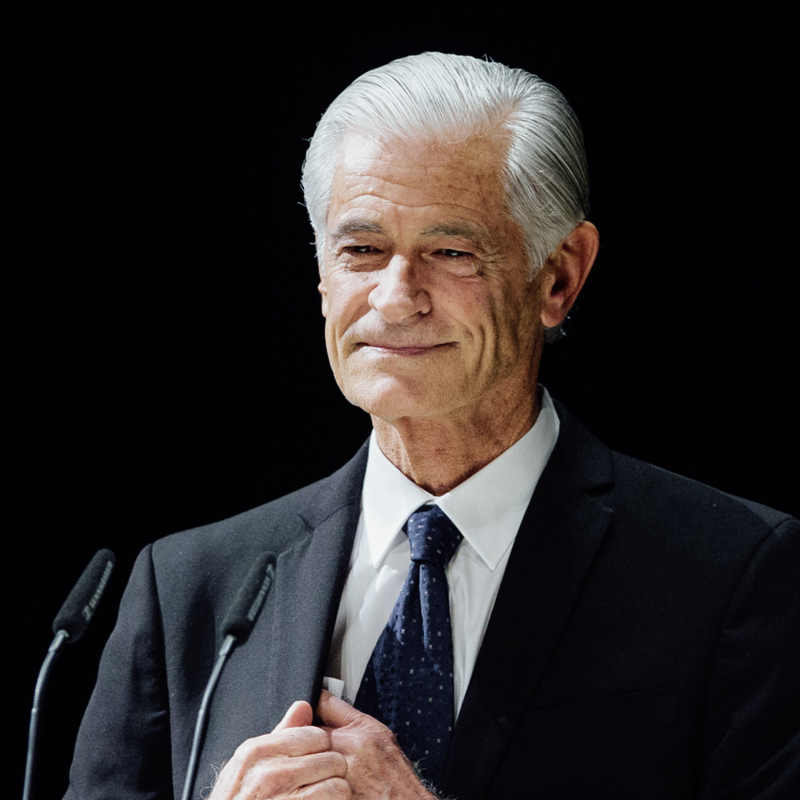 On 18 February 2018 – a few hours after the award of the 9th Dresden Prize – he died. The 10th award ceremony was dedicated to him. 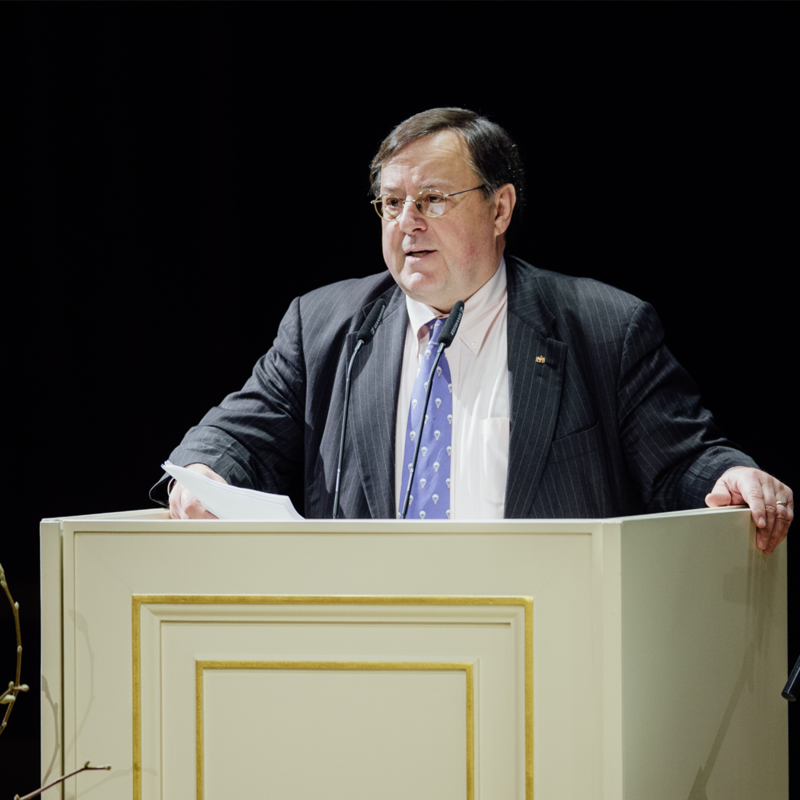 John Patrick Schmitz (Photo), board member of Friends of Dresden Inc. (founded at Günter Blobel in New York 1994), Washington lawyer and long, close companion of George Bush senior, recalled his friend Blobel in a very emotional speech. At the end he said in tears: “Günter, we thank you”. Then the 1400 guests rose in the opera to commemorate Günter Blobels. 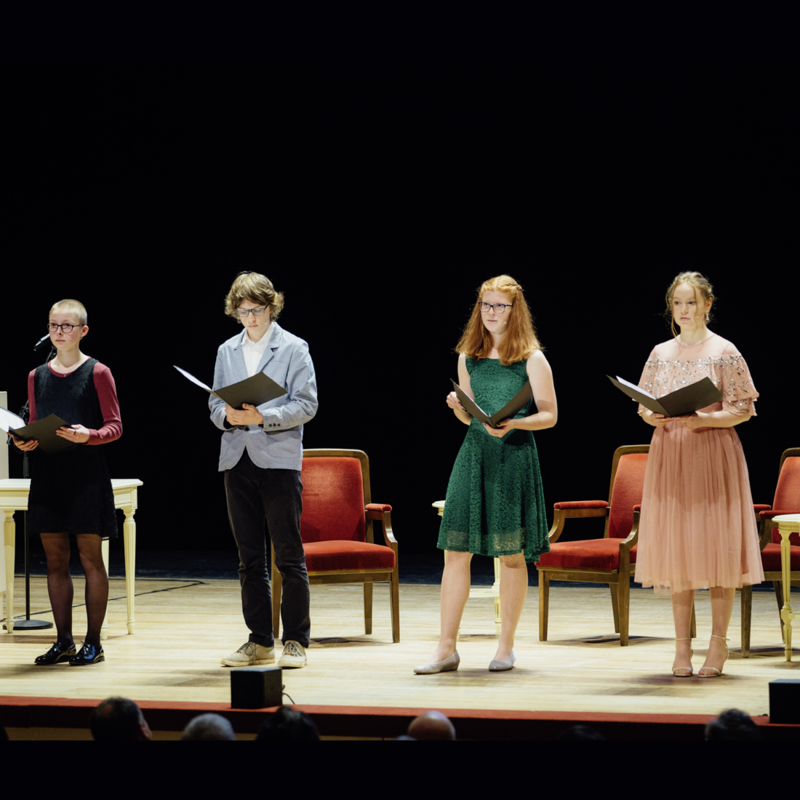 Under the title „You will not have my hate“ four Dresden students reported during the award ceremony in a scenic reading of victims worldwide who, like Kim Phuc, refuse to accept hatred. Just as relatives of victims of the attack on the World Trade Center do, who speak out against wars of retribution. Or a Colombian woman who lost three sons in the civil war and is now looking after arrested relatives of Farc, who was responsible for many murders. Or the parents of a student murdered by an Afghan refugee in Freiburg, who set up a foundation in the name of their daughter that also expressly supports foreign students. 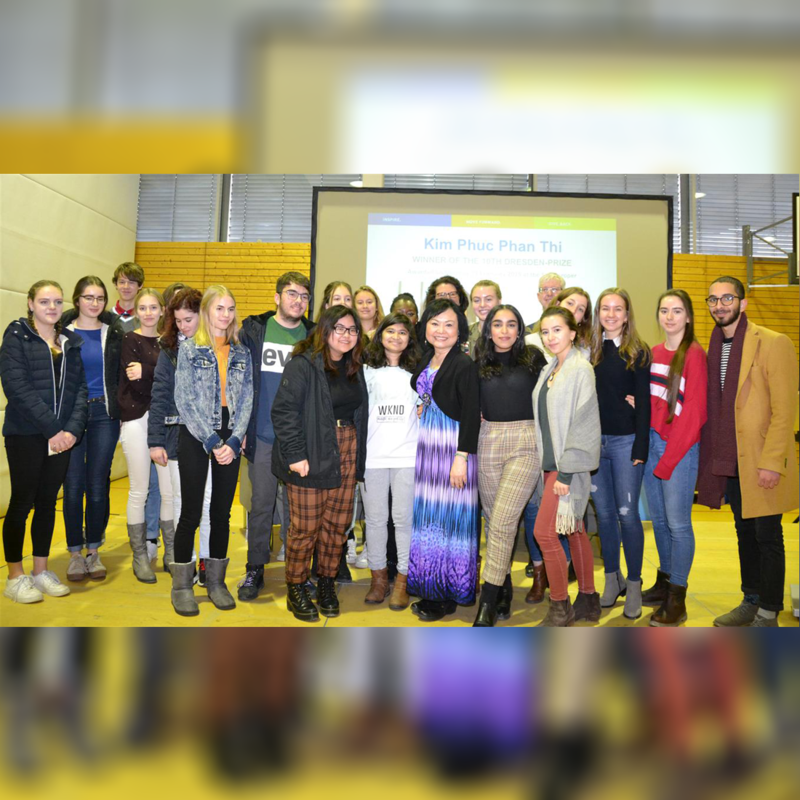 Girls and boys from Dresden International School had the honor to welcome Dresden Peace Prize awardee, Kim Phúc Phan Thi, peace activist and war survivor from the iconic Napalm Girl photograph taken during the Vietnam War. Secondary school students showed her their learning environment at Dresden International School and had the chance to get one of her books signed. Afterward, she met students from grade 5 to 12 where Kim Phúc held a powerful speech and answered questions. DIS students and teachers were impressed by her personality and how she spoke about her life and experience, learning how to be “strong in the face of pain” and how faith and love helped her heal. Kim Phúc explained to the students how important forgiveness is and that everyone can forgive. She made it clear that you cannot change the past, but everyone can work together for a peaceful future.